Student's Books come in both 'with answers' and 'without answers' editions and a Teacher's Book is also available.  Accompanies a Student's Book containing specially updated PET practice tests from University of Cambridge ESOL Examinations.  Contains recorded material from PET examinations. 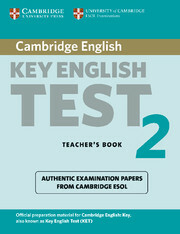  Familiarises students thoroughly with the updated content and format of the Listening test (Paper 2).